Most of the testers and managers I meet seem to have a similar perception of Agile testing. They think it’s “doing QA work on an Agile project”. That’s when I start worrying. Pause here. Take a few seconds to think about it. What do you think is the best tool for Agile testing? Ready for my answer? Most testers (and their managers) aren’t ready for it. It’s not Selenium, Cucumber, QTP or Python. My answer: It’s between your ears. The best tool for Agile testing is a critical mind. 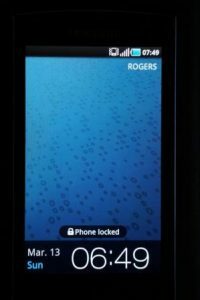 Here is a picture of my Android 2 phone on the morning after Daylight Savings Time kicked in. Look at it for a few seconds. Really look! Don’t just skip to the rest of this article. If you’re good at testing, chances are you noticed that on the bottom the hour is 06:49, and on the status line the hour is 07:49 (which is the correct one). … How can I devise a test to expose this problem? … When could we have missed that? … Can I reproduce it? If you’re an Agile tester, you might also ask this question: How come the phone is showing two clocks? Notice something about this question? You’ve graduated from problem-thinking to critical thinking. You’re critiquing the phone’s design: Why is the user looking at two clocks? Wouldn’t one do just fine? No test case, steps-to-reproduce, fancy tool, req doc, traceability matrix, or spec involved. Just a human mind observing a product and asking… Why. How come. What if. You still look for problems, of course. And some areas of the product still merit comprehensive checking and detailed analysis. AND you apply your critical thinking skills in order to increase extrinsic quality. Too often, testers are locked into the reactive mode of checking the product for conformance to someone’s requirements, of giving a compliance stamp. The best Agile testers I know go beyond verification and truly add value to great products by validating the thinking that went into them. P.S. In case you’re curious, this matter was fixed in Android 5. Copyright © 2011, 3P Vantage, Inc. All rights reserved.